An interesting article came under discussion today between Cene and I. Anne Midgette recently wrote an article for the Washington Post on the use of classical music to control a population or population’s behavior in a public area. Midgette begins the article describing a recent trip departing from Port Authority. Now, if you have never been to Port Authority in NYC…it is not a very fun experience. I may be a small town girl from Alaska, and therefore don’t deal well with crowds – but I do love NYC and hate Port Authority. Anyways, Midgette describes sitting in P. Authority waiting, and suddenly becoming aware of a blasting Schubert trio. Normally she loves Schubert’s trio but on that particular day, she just wanted the music to stop. When questioned, a P. Authority spokesperson said the music was played to entertain visitors…but other public areas blast classical music over loud speakers to deter the homeless or groups of rowdy teenagers. In the 1980’s 7-Eleven began playing classical music out to parking lots, and many stores have taken up the idea, to keep teens from loitering. 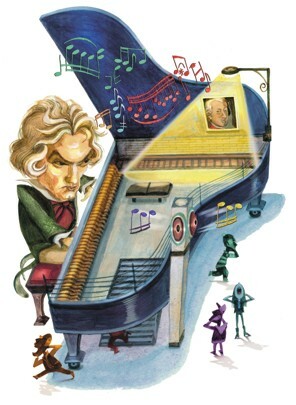 In 2011 police in West Palm Beach, Florida blasted Mozart and Beethoven on a crime-ridden street corner and saw incidents go down. Still this kind of behavior molding idea fits nicely into society’s view of classical music overall. University students know Plato advocates for music’s place in education to create a good citizen. It calms patients in surgery. It can help “socialize inner-city children.” Just take a look at the program, El Sistema, in Venezuela where famous conductor, Gustavo Dudamel, got his start. But blasting classical music in a 7-Eleven parking lot does seem somewhat elitists. It almost confirms the social mindset that civilized human beings understand and enjoy Mozart…and hulligans run from it like crazy cartoon villains. I, for one, don’t really buy that mindset. So blasting Schubert’s piano trios over a less-than-perfect sound system at Port Authority might not define the space in the kind of way for which the music was intended (I mean really…how can Port Authority be anything but chaotic?) it is an interesting idea on how to view and use music. Loading in some new CDs!